Congratulations 2019 Commencement Award Winners! To view the names, click here. Important graduation info can be found below. 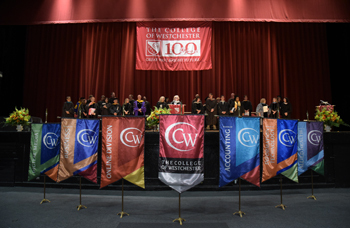 All graduates MUST pick up their cap & gowns prior to Commencement at The College of Westchester in Room 504. No appointment is needed, just stop by. All for only $50.00 including tax, postage and handling. Payment is due at the time of the sitting. Cash, check and credit cards are accepted. The photos will be mailed to you. Please allow 4 weeks for delivery. 1. ALL GRADUATES SHOULD ARRIVE AT THE WESTCHESTER COUNTY CENTER BY 12:45 p.m. WITH YOUR CAP AND GOWN. CEREMONY PROMPTLY BEGINS AT 2:00 p.m. Please note there is a $15 fee to park at the Westchester County Center. 2. TICKETS ARE NOT REQUIRED AND SEATING FOR GUESTS IS UNLIMITED. 3. REPORT IMMEDIATELY TO THE LOWER LEVEL. You will enter through the main door and make a left, then proceed down the stairs to the lower level where the staff will distribute index cards. Students should check to make sure that the index card has the correct name, major, and honors, if any. The card will also have a number which is used to help line up students for the processional. For your convenience, hairpins, safety pins, and mirrors are available. Do not bring pocketbooks or coats as there is no secure place to leave them. 4. NEXT, LINE UP BY MAJOR AND BY ALPHABETICAL ORDER. USE THE NUMBER ON YOUR INDEX CARD TO HELP GET IN THE RIGHT PLACE ON LINE. 5. THE PROCESSIONAL WILL BEGIN PROMPTLY AT 1:55 p.m. Proceed down the aisle in a dignified manner. Remain standing until instructed to sit. Latecomers will be escorted to their seats at the discretion of the Marshall. 6. WHEN YOUR PROGRAM MAJOR IS CALLED, walk carefully down the center aisle to the stairs on your right. Give your index card to the administrator at the podium. Proceed to walk across the stage as the administrator calls your name. Shake hands with President Del Balzo. Then proceed to your Department Chairperson who will present you with your mock diploma. Please note that the mock diploma has instructions on how to pick up your degree. Take the mock diploma with your left hand and shake hands with your right hand. Proceed across the stage to the stairs and go back to your seat using the center aisle. 7. WHEN YOU RETURN TO YOUR SEAT, please stay until all the graduates’ names have been called. You and your guests are expected to stay for the RECESSIONAL. 8. FOR THE RECESSIONAL, PLEASE LEAVE AS A GROUP. Do not step out of line to greet friends or guests. 9. AFTER THE RECESSIONAL, proceed directly out the front doors of the County Center. After leaving the County Center, graduates and families will not be allowed back in so please be sure to take all of your belongings. REMEMBER WHEN COMING TO THE EVENT, PLEASE ALLOW PLENTY OF EXTRA TRAVEL TIME FOR TRAFFIC, PARKING, AND WALKING TO YOUR SEAT BEFORE THE 2 PM START. 2. From west side, take West Side Highway north to Saw Mill River Parkway to Cross Westchester Expressway (I-287) eastbound and follow directions as in #1 above. 3. I-95 (The New England Thruway) to Exit 21; follow to Cross Westchester Expressway (I-287) westbound. Exit 5, “Route 100,” turn left. Follow to traffic light at intersection of Route 119 and turn left. The County Center is approximately 3/4 mile on the left. Take Whitestone Bridge, follow signs for Hutchinson River Parkway northbound. Follow to intersection of the Cross Westchester Expressway (I-287) westbound. Follow directions as in #3, above. Throgs Neck Bridge to I-95 (The New England Thruway and follow to Exit 21, Cross Westchester Expressway (I-287) westbound. Exit 5, “Route 100,” turn left. Follow to traffic light at intersection of Route 119 and turn left. The County Center is approximately 3/4 mile on the left.